Yet most political consultants think differently. Most think the best way to win an election is to bad-mouth your opponent. The advertising industry knows better. 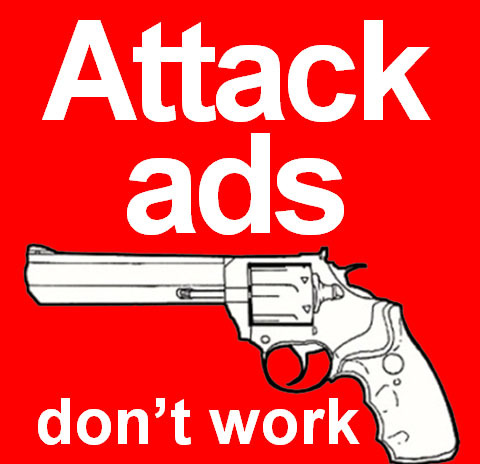 Few national advertising campaigns attack the competition. They just doesn’t work. Suppose Coca-Cola ran an advertising campaign attacking Pepsi-Cola with the same vitriolic language used by both Donald Trump and Hillary Clinton. Would an anti-Pepsi campaign damage the Pepsi-Cola brand? It certainly might. But it would also do something else. It would damage the Coca-Cola brand, creating the impression that all cola products are bad. It’s the pot calling the kettle black. Isn’t that what has happened in the Presidential campaign of 2016? The approval ratings for both candidates are dismal. What is true in politics, however, is that a serious candidate needs to mention his or her opponent. You offend potential voters if you pretend to be the only candidate in the race. But there’s a way to do that without denigrating your opponent. There’s an important communications principle involved here. When you are in competition with another individual or another brand, you are not an independent, unbiased observer. You are prejudiced in favor of yourself or your brand. My first real job was in the industrial advertising department of General Electric. And the first major campaign I worked on involved distribution transformers. At the time, GE was in second place to Westinghouse in transformers. The sales department had prepared a memo comparing GE distribution transformers with its major competitors on a number of product features. So we took five key features and did five advertisements, all with the headline, All transformers are not alike. Each ad had a check chart comparing GE with its competitors on those five features. Naturally, GE transformers had all five features and none of its competitors had more than one or two. The first obstacle was the sales manager who complained about the headline. Why can’t we say: GE transformers are better and here’s why. Well we could, I said, but this is a General Electric advertising campaign and everybody knows GE thinks its transformers are better. I’d rather have the readers of the ads come to that conclusion on their own. The second obstacle was the man I worked for. He didn’t like the ads either and said I would have to come up with another approach. One thing you learn early on in advertising is this: You ever get a second chance to make a first impression. If someone (advertising executive or consumer) has a negative first impression about an ad, it’s isn’t going to get any better no matter how much you talk or how many ads you run. So I put it this way: If we don’t run these ads, I quit. Being young and foolish is not necessarily a bad thing. So the ads ran and the next year GE became the leader in distribution transformers. The transformer people were pleased. They even coined a name for the campaign, using the initials of the headlines, ATANA. Most people want to be nice. They follow the old axiom If you can’t say something nice, say nothing at all. Most people want to be for something rather than against something. But in politics, you have to be against something (your opponents) if you want to get elected. That’s the tricky issue. Take the Brexit vote in the United Kingdom. Most observers thought the vote would fail since a majority of political leaders including Prime Minister David Cameron were against it. The anti-Brexit people made a serious marketing error. They were against something (Brexit) instead of being for something. A better strategy might have been to develop a specific program to “fix” the European Union. And then develop a logotype using the “Fix It” idea. Perhaps like the logotype developed for WorldFirst, a European currency company. Now a voter can be for “fixing the European Union” instead of being against the European Union. Take a brilliant Hertz campaign launched in 1966. For years, Avis had been increasing its market share by running a campaign comparing itself to Hertz. Typical headline: Avis is only No.2 in rent a cars, so why go with us? We try harder. My friend Carl Ally, another GE alumnus, and his agency Ally & Gargano, got the Hertz account and immediately dealt with its Avis problem. Typical headline: For years, Avis has been telling you Hertz is No.1. Now we’re going to tell you why. The Hertz campaign stopped the Avis onslaught. From then on, market shares of the two leaders stabilized. Then came Enterprise, but that’s another story. In politics, as in advertising, you need to create the impression that your marketing messages treat your opponents fairly. And the best to do that is that is to let your opponent win anywhere up to 49 percent of the argument. In other words, you take a single issue and polarize it, forcing your opponent to take the opposite side of your position. Exactly what Donald Trump has done with immigration. I’ve mentioned it before, but my advice for a Republican candidate for President is to use a variation of Warren G. Harding’s slogan: Less government in business and more business in government. That would give the other party the ammunition to launch a number of attacks. They could dredge up a host of negative stories about business disasters. Mylan’s EpiPen, for example. And Wells Fargo and its chief executive John G. Stumpf. Who could trust a business executive to run an entire country? Then you could bring up the other side of the argument, mentioning the Postal Service, Amtrak, the national debt and many other activities of a government that runs things politically rather than efficiently. The list is endless. Make the election about you, not your opponent. That’s exactly what Donald Trump has done. (He also has made a lot of tactical errors.) That’s why the media coverage is dominated by stories about Trump, not stories about Clinton. You either like Donald Trump or loath him. And Hillary Clinton is waiting on the sidelines hoping the loath voters will outnumber the like voters.